With the solar energy market still being relatively untapped and the government of Philippines is planning to reach 20 GW of solar installations by 2040, the solar inverter market in the country is expected to witness significant growth over the next six years. Growing focus of the government for the development of solar farms in tandem with the initiatives being launched for the same would benefit the growth of Philippines solar inverter market over the coming years. According to 6Wresearch, Philippines solar inverter market size is projected to grow at a CAGR of 2.4% during 2018-24. The market by vertical is dominated by the utility sector, owing to large number of inverter installations in this segment. Further, with large number of the upcoming projects approved by the Philippines government in the utility sector, the segment is expected to continue its dominance in the country over the forecast period. Due to a lower per watt price, greater efficiency and high utilization in the utility and large-scale commercial segments, central solar inverters dominated the overall Philippines solar inverter market share in 2017. Micro inverters, on the other hand, occupied small revenue share owing to higher per watt price and their inability to be used efficiently in high power generation capacity applications in power plants. Philippines solar inverter market report thoroughly covers solar Inverter market by power rating, types, applications and regions. 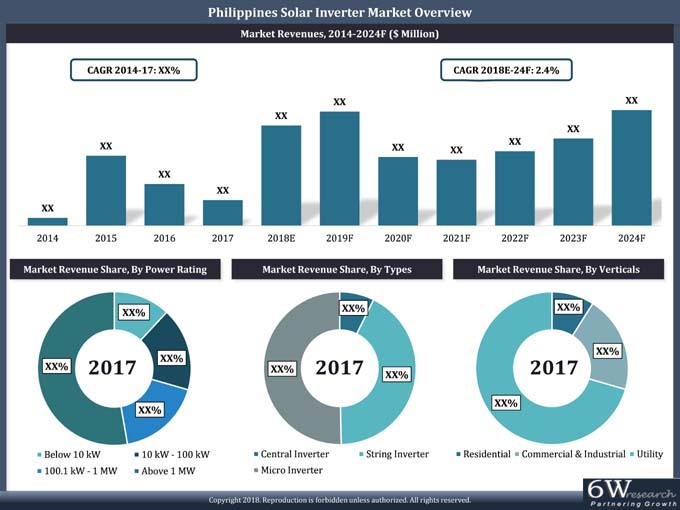 Philippines solar inverter market outlook report provides an unbiased and detailed analysis of the Philippines solar inverter market trends, opportunities/high growth areas and market drivers, which would help the stakeholders to device and align market strategies according to the current and future market dynamics. •	Historical Data of Philippines Solar Inverter Market Revenues and Volume for the Period 2014- 2024F. •	Philippines Solar Inverter Market Size & Philippines Solar Inverter Market Forecast, Until 2024. •	Historical Data of Philippines Solar Inverter Market Revenues and Volume by power rating for the Period 2014-2024F. •	Historical Data of Philippines Solar Inverter Market Revenues by types for the Period 2014-2024F. •	Market Size & Forecast of Philippines Solar Inverter Market Revenues by types for the Period 2014-2024F. •	Historical Data of Philippines Solar Inverter Market Revenues by verticals for the Period 2014-2024F. •	Market Size & Forecast of Philippines Solar Inverter Market Revenues by verticals for the Period 2014-2024F. 14.1 Jiangsu Goodwe Power Supply Technology Ltd.
14.7 SolaX Power Co., Ltd.